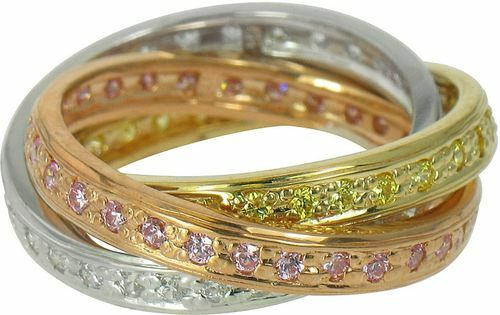 Our Pave Set Cubic Zirconia Rolling Ring Trinity Ring Russian Wedding Ring Eternity Band features three interwoven bands in 14k white gold, 14k yellow gold and 14k rose gold with coordinating lab created laboratory grown simulated diamond, simulated canary diamond and simulated pink diamond cubic zirconia stones. The Pave Set Rolling Ring features three interwoven pave encrusted bands that come together to make a single eternity band. The Pave Rolling Rings are uniquely designed and when placed on your finger, each band will float across each other band until it is perfectly set in place. 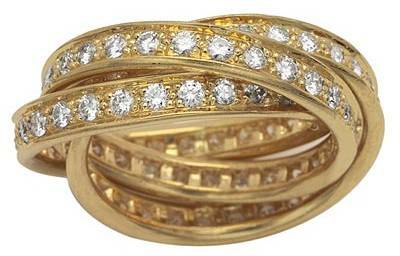 This eternity style band features three bands with expertly placed pave set round cubic zirconia. 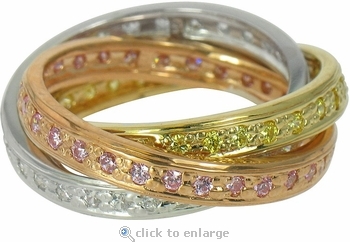 Available in your choice of solid 14k yellow gold or 14k white gold with all diamond look stones or 14k tri-color gold with diamond-look, pink and canary cubic zirconia simulated diamonds as featured. Each band measures approximately 3mm in width for a total carat weight of approximately 3 carats for all three bands. For finger sizes not listed in the pull down menu, please call us directly at 1-866-942-6663 and speak with our special order department.